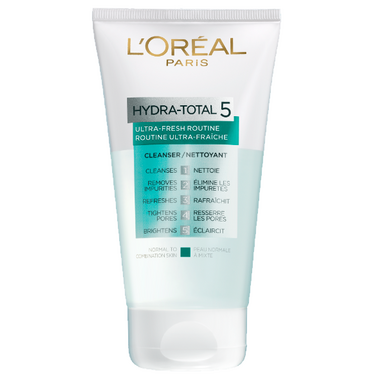 L’Oréal Paris laboratories created Hydra-Total 5 Ultra-Fresh routine, designed specifically for normal to combination skin. The Gel Cleanser makes skin feel clean and refreshed. It removes skin’s impurities and leaves a fresh feeling. Skin is perfectly clean, feels fresh and revitalized. INGREDIENTS: AQUA, SODIUM LAURETH SULFATE, COCO-BETAINE, GLYCERIN, SODIUM CHLORIDE, BENZYL ALCOHOL, BENZYL SALICYLATE, CITRIC ACID, CITRONELLOL, GERANIOL, HEXYL CINNAMAL, HYDROXYCITRONELLAL, LIMONENE, LINALOOL, MENTHOL, POLYQUATERNIUM-7, PPG-5-CETETH-20, SALICYLIC ACID, SODIUM BENZOATE, SODIUM HYDROXIDE, PARFUM. This cleanser is amazing! My skin feels clean and refreshed. I love the entire routine and I have never had such a clear skin tone!